The FW3 is only available in Classic Black frames with Piano Black trim and 18 Hole Lithium Battery in the U.S. 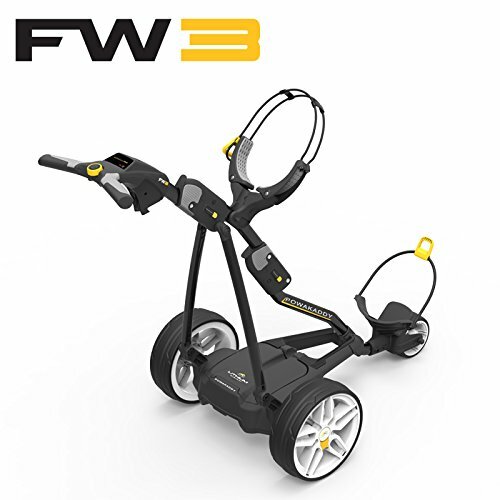 Attractive pricing and an inheritance of the best aspects of the immensely successful PowaKaddy Freeway makes the FW3 the ideal entry-level option. A number of design advancements have been made, namely a modernized PowaFrameTM and low-profile chassis, creating a distinct eye-catching profile. Of the many features which make the Freeway range so appealing, the Plug 'n' PlayTM Battery System will perhaps be most pleasing. It replaces fiddly connectors with a streamlined cassette system which allows both Lithium and Lead Acid batteries to quickly slot into place. Adding to the many features are the whisper-quiet motor, 5-spoke quick-release wheels and a front wheel adjustment. If you're seeking unbeatable performance and reliability then you will be delighted with the FW3. If you have any questions about this product by Powakaddy USA, contact us by completing and submitting the form below. If you are looking for a specif part number, please include it with your message.